Within milliseconds visitors to a website begin to take in information and make judgements about what they see. They immediately form the context through which they’ll interpret everything else they encounter on the site. In such a short amount of time all they can realistically take in is a quick impression of the aesthetics of your design. How confident are you in your ability to visually communicate a message over an instant of time? This book begins with visual perception, the way in which your eyes take in visual information for further processing and storage. It makes the case that most things related to graphic design arise out of how our eyes work. Design Fundamentals walks through graphic elements like dots and lines, talks about how to differentiate one element from another through attributes, such as size and color, and finally covers the basic principles and guidelines of graphic design to put everything together and help you communicate your ideas visually. The ebook comes in three versions, .mobi. .epub, and .pdf. All three can be downloaded individually or together in a single .zip file. This is a short introduction sharing why I decided to write the book initially and what’s inside. A walk through of the two-way process of visual perception. This chapter talks about how our eyes take in visual information for processing and how our memory influences what our eyes notice. The marks you make on the canvas as well as the canvas itself. This chapter covers space, points and dots, lines, planes and shapes, and volumes and mass. Different characteristics you can apply to elements. Characteristics like patterns, textures, size, scale, proportion, and color. The chapter builds to talk about visual weight and visual direction in a composition. This chapter begins with a discussion of gestalt principles and how the principles arise out of visual perception. 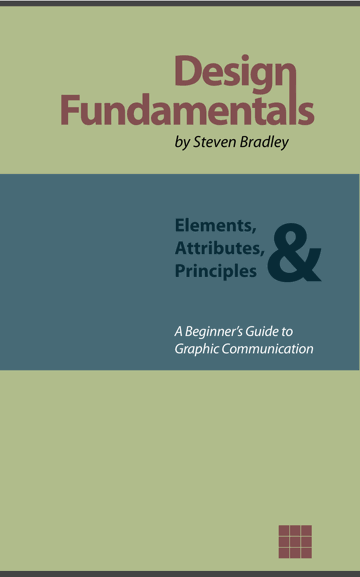 It then covers principles and guidelines of graphic design such as similarity, contrast, dominance and focal points, hierarchy, flow, and balance. Still not sure? You can download a sample from the book here.